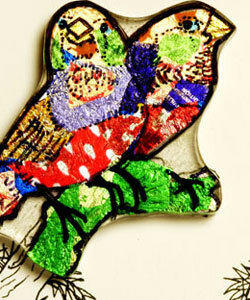 Inspired by 1930-1940s foil pictures, these brooches depict various breeds of birds, each brightly coloured using patterned and textured foils. These are accompanied by flower earrings that reflect the foils used in the brooches. If you have a pet bird why not get a commission made which could include some of its fallen feathers?